There’s one word that best describes the new Phantom speaker: Loud. Divialet’s new Phantom Gold, available for preorder starting today and shipping July 14, is so loud (108dB), it’s equivalent to a live rock concert. 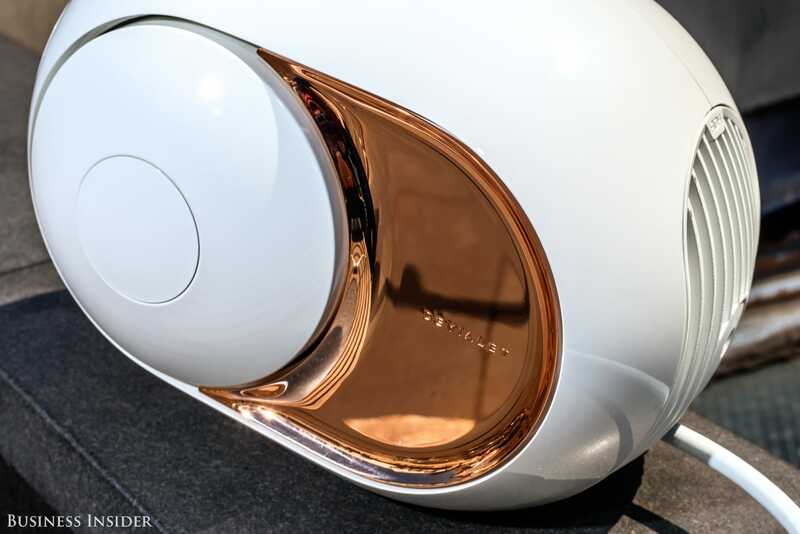 It’s encased in 22-karat gold, looks a lot like a dinosaur egg, and costs about $2,990. The company claims some unique technology for the Phantom — so unique that Will.i.am purchased 18 of them, former Android boss Andy Rubin bought 120 to give out to his friends, and Beyoncé and Jay Z are listed as “happy owners”. Essentially, Divialet says it combined aspects of Class A and Class D amplification in a single package — Class A is considered the gold standard by many audiophiles, while Class D is known for being highly efficient. Divialet says it spent $25 million on research and development, filed for 88 patents, hired 44 engineers and began operating 24 factories in France. 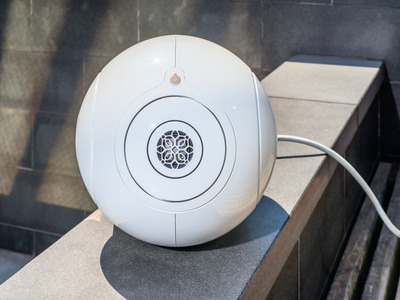 The company’s various teams worked closely together to develop the Phantom, blending elements of design and software to make the best possible product. While the Phantom isn’t a copycat of Apple’s designs, it does coordinate with Apple products, and Apple started carrying it in its stores last December. Now, Divialet says it has more product on shelves in Apple stores than any other third-party brand. But the Phantom had an unusual journey to Apple’s shelves. From its inception, Divialet had been hoping to work with Apple in some capacity, even hoping for Steve Jobs himself to personally invest. When it wasn’t having much success in getting Apple’s attention, the company reached out to Salesforce CEO Marc Benioff, who was a huge Phantom fan. One hour later, he emailed back with contact information for Angela Ahrendts, vice president of retail and online stores at Apple. As of right now, Divialet doesn’t expect the Phantom Gold to be quite as individualized as other Bluetooth speakers on the market, meaning that it’s meant to be shared by an entire household — Salzman said to think of it the way families used to think of a desktop computer or a house phone. It’s portable, but not as portable as, say, a Beats Pill. And while the Phantom is a Bluetooth speaker, it does still plug into the wall and is not battery powered. Salzman said the company hesitated to add the option for Bluetooth because it worried about unreliability and diminished sound quality. In the end, though, Divialet realised Bluetooth was crucial to making a sound system in 2016. “If you want to make a mass premium, you need to make a product that can use Bluetooth and mp3,” Salzman said. While Business Insider hasn’t run the Phantom Gold through its paces, a brief listening session showed it could blast Jay Z with just as much precision as it plays the intro of the Eagles’ “Hotel California.” It was loud enough to hear Jay Z’s “Tom Ford” from 25 feet away on a breezy rooftop. Plus, it’s beautiful and creates a more democratic listening experience that doesn’t require sitting in one specific seat in a room to find the sweet spot.